LaVell Edwards Stadium. Photo by Mark Philbrick. BYU is the first college football program in the country to implement the same cutting-edge, high-density wireless solution used in many NFL stadiums. 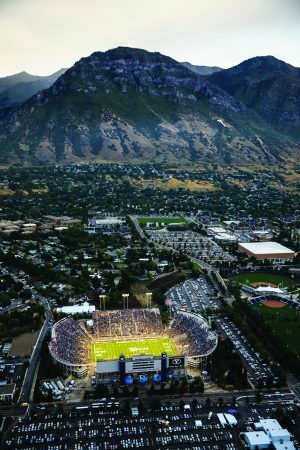 With more than 46 miles of cable and 1,200 antennas, the new state-of-the-art Wi-Fi now in place at LaVell Edwards Stadium can connect a capacity crowd on one network at the same time. But installing hardware and increasing bandwidth aren’t the only impressive plays BYU Athletics has executed. With the new BYU Gameday app, fans can enjoy what associate athletic director D. Duff Tittle (BA ’90) calls a “second-screen experience” in the stadium. The most exciting feature might just be instant replay: not long after first downs, touchdowns, or three-and-outs, fans will be able to view the action again right on their own phones. The free app—now available for Apple or Android download—also features the radio broadcast, real-time statistics, interactive games, and concessions ordering. In the coming year, the four corners of the stadium will be joined, which will provide more restrooms and better accessibility. Just up the street, the Marriott Center is also getting a Wi-Fi upgrade that will enable a higher level of interactivity and enjoyment during basketball games, devotionals, and other campus gatherings. This powerful wireless communications tool was made possible by the J. Willard and Alice S. Marriott Foundation with a donation given to honor a master communicator: former Church president Thomas S. Monson. The four game-day traditions that “ROC” BYU sports.